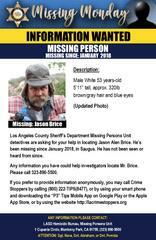 Los Angeles County Sheriff’s Department Missing Persons Unit detectives are asking for your help in locating Jason Alen Brice. 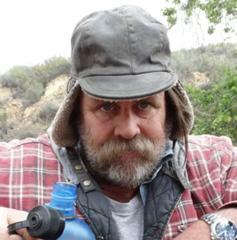 He’s a 53 year-old man who has been missing since January 2018, in Saugus. Mr. Brice is 5’11” tall, approximately 320lbs, brown/gray hair and blue eyes. He has not been seen or heard from since January 2018. Anyone with information about this incident is encouraged to contact the Los Angeles County Sheriff's Department's Homicide Bureau, Missing Persons Unit, Sergeant Nava, Detective Abraham or Detective Pereida at (323) 890-5500.